Material: What are the hands made of? The hands are sculpted from the earth of Niujiatan, fortified with hair from their cows. I use the same soil used to build the kang (炕) in village homes. Cow hair acts as fiber; strong and resilient, it represents the Nius, whose surname means "Cow". 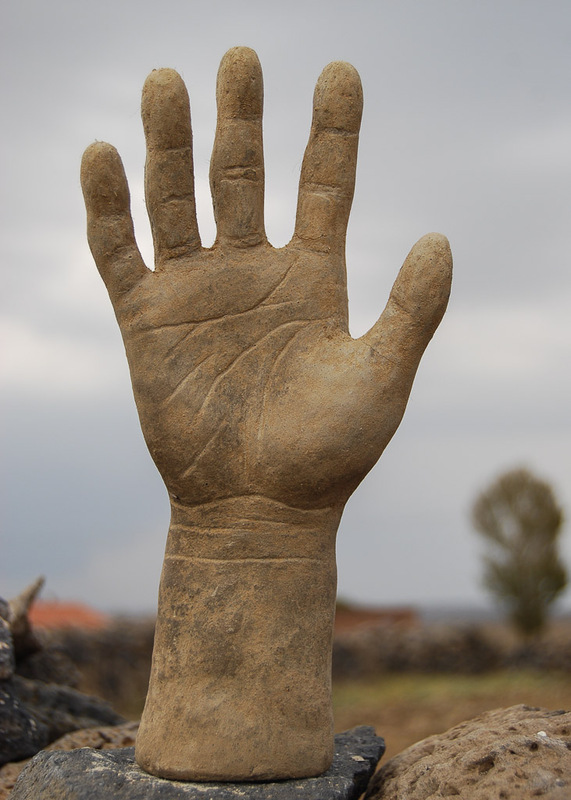 Combined with other materials they form a hybrid adobe that is solid and durable yet, like the lives the hands represent, not indestructible. Susceptible to injury, affected by the elements, the hands express the vulnerability and uncertainty of a farmer's life in China. 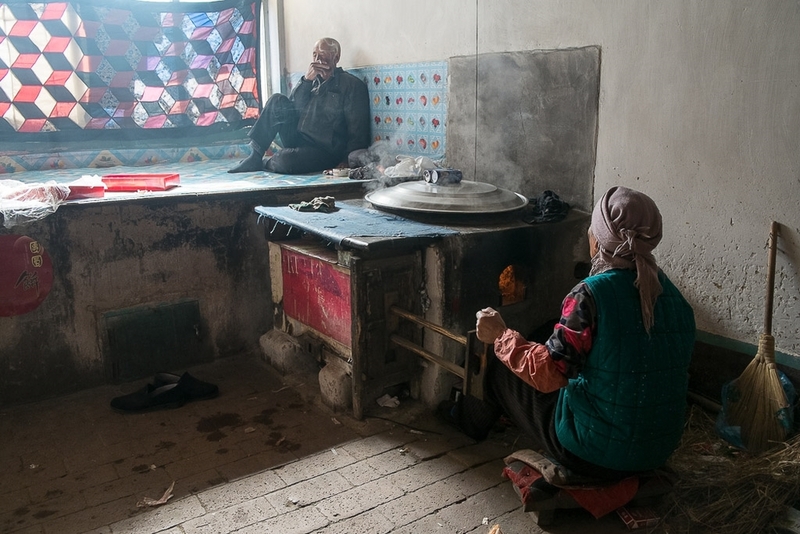 In northern China the kang or "bed-stove" is the heart of a traditional Chinese home. The kang is a raised heated platform running the length of one wall where the family gathers for every indoor activity: eating, sleeping, working, entertaining… Construction varies by region. In Niujiatan the kang is made from a sandy yellow loam, dug from a pit below the village, that forms a heat-conducting adobe. Hot smoke from the kitchen stove heats the kang. A flue runs from the stove through the interior cavity of the kang and out the chimney. 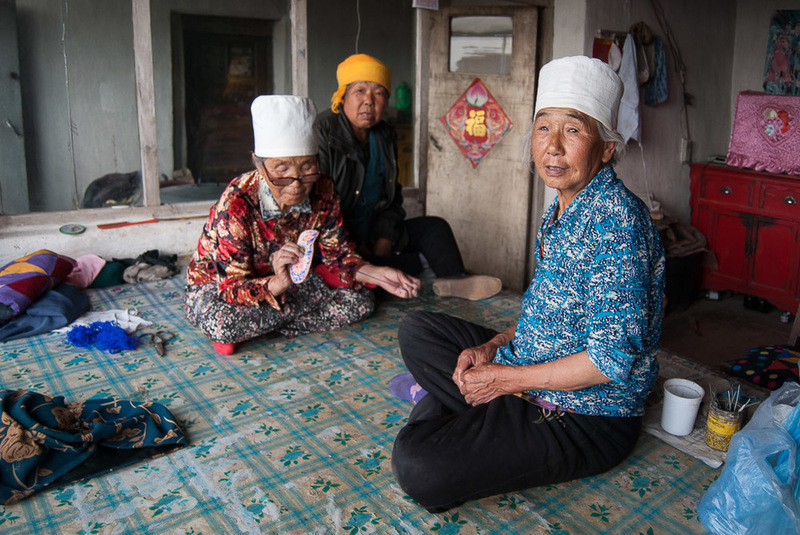 After more than 50 years together in Niujiatan, Niu Zhenshan and Yu Xiulian enjoy the last days in their village home; in November 2013 their six children moved them into an apartment in Zhangbei Township. The stove-kang unit forms the center of every home, with some variation in interior lay-out. In Niu Ming (not shown) and Zhang Shuzhi's home, where the stove and kang are separated by a wall, the inner room and kang can be seen through a glass siding. The wok is used to stir-fry, deep fry, and steam food, as well as wash the dishes. The kitchen stove is fueled by dried cow dung mixed with oat straw and, when available, twigs gathered from the trees planted around Niujiatan in the 1980s. Niu Mei feeds the fire with his left hand and with his right pumps the built-in bellows to deliver blasts of air. Families gather on the kang to eat their meals. An oil cloth or cutting board is laid out as the table, and everyone sits cross-legged facing the food. The tiled square on the right behind the kang is the stove. This old mother, Shi Yumei, and her bachelor son Niu Gui moved from Niujiatan in 2013. She now lives with her daughter in Zhangbei Township; he is a migrant laborer. Children often prefer to sit at the edge of the kang, where they are closer to the TV and have more freedom of movement. Niu Yun and Liang Fengxian are raising their granddaughter, whose parents work in Beijing. In 2013 they moved from Niujiatan when she started junior high in Zhangbei Township. The kang is wide and deep. It is the best workbench in the home for food preparation: rolling out dough and making noodles, dumplings, and the flat fried cakes Yu Xiulian is preparing here. This is the same home shown in the first photo, viewed from the window side of the kang. Niu Zhenshan, sitting on a stool back left, is firing up the stove. 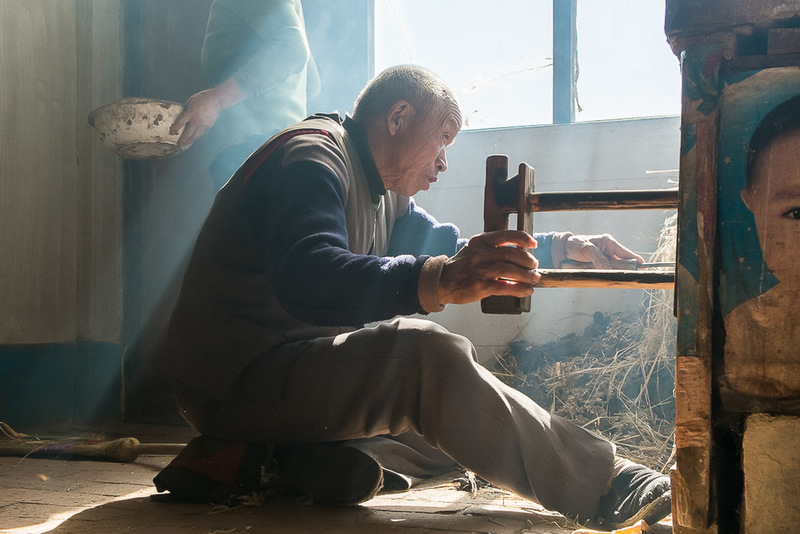 The kang is used all through the year as a place to sit and do handwork. In winter and slack periods of farm work, women mend clothes and sew bedding. Qiao Hua, one of the youngest women in Niujiatan, sits on her kang to stitch up a sleeping pad. In autumn after the potato harvest, low grade potatoes are culled and pressed into potato starch. The kang is used as a drying table for the freshly strained and rinsed powder. At night, when the family retires, the starch is collected in a holding bin, to be re-spread on the kang the next morning. The drying process takes about 3 days. In remote villages, people rely on each other to survive. Social etiquette places high value on visiting each other. It it polite and expresses good neighborly relations to just drop in, as Niu Yun (left) did one summer afternoon at the home of his next-door neighbor Niu Pingshan. Both men are now gone. Niu Yun moved to Zhangbei Township in 2013; Niu Pingshan died in 2012. During the day the kang is a big living room couch, where everyone can sit together. Visitors are urged to "get on the kang!" Depending on the relationship and length of the visit, visitors will climb up and settle in (next-door-neighbor Yu Xiulian, on the left with her embroidery) or perch halfway on the edge (He Wanjing, in the back). 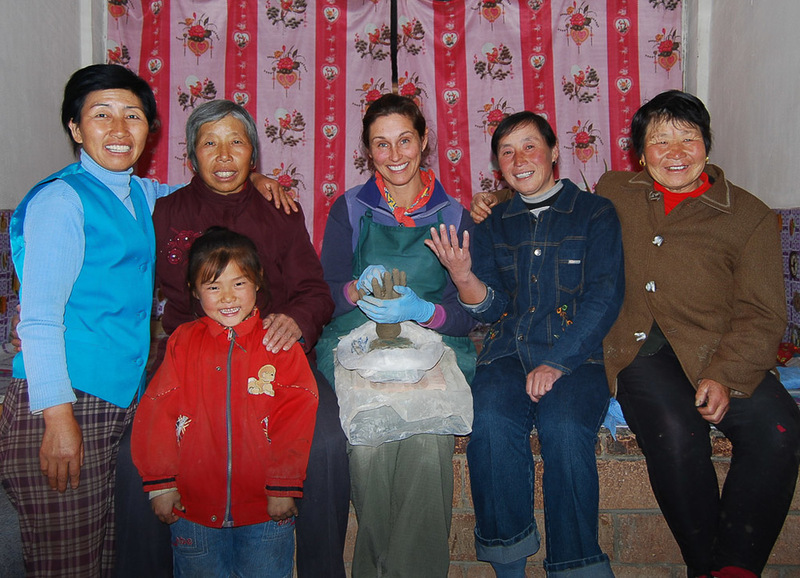 In this photo the women had gathered on a summer afternoon in 2011 to watch me make Zhang Shuzhi's hand. 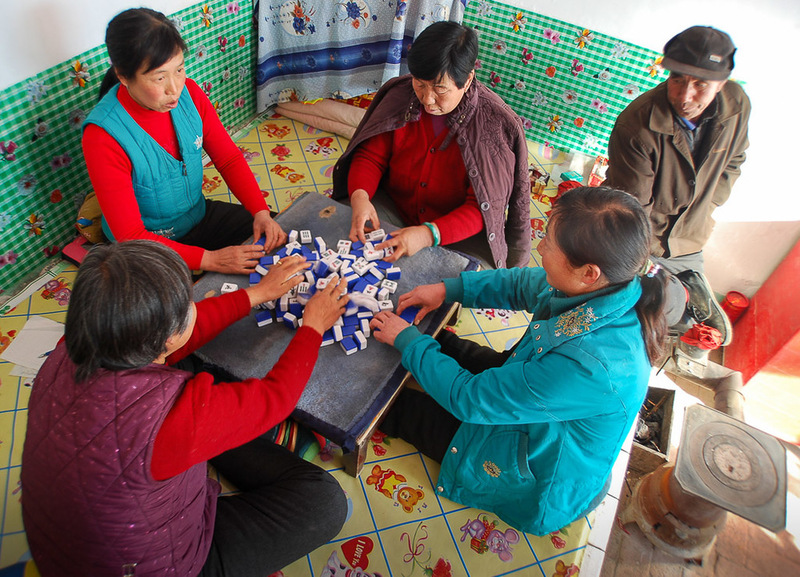 In winter and during slack periods of farm work, villagers gather to play mahjong. A low table is set up on the kang, and four people sit cross-legged around the table. As families move away, gatherings like this one in November 2008 are increasingly difficult to arrange, and players often have to walk to other villages to make up a table. When there are a lot of guests, men typically sit on the kang, and women serve, perch on the edge, or sit at a table on the floor. The place of honor on the kang is in the back, facing the room. 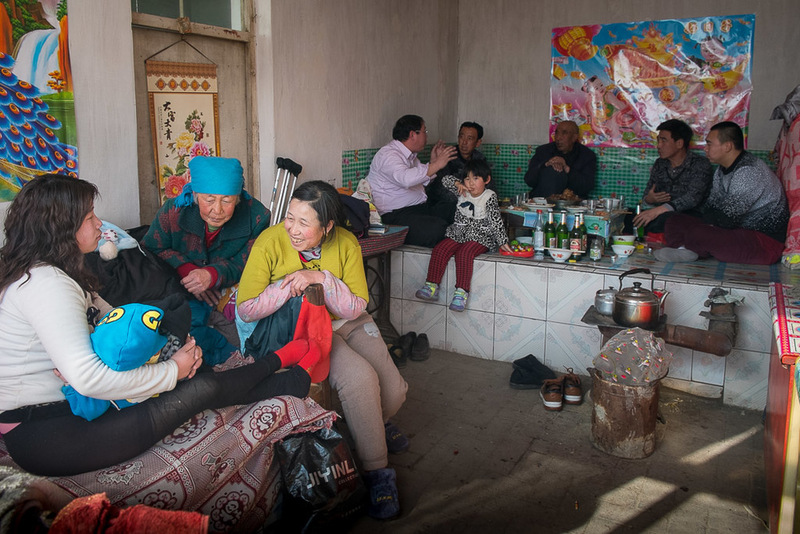 In this photo, guests of local village leader, Secretary Wang (second from right), and his wife Qiao Hua (yellow sweater) linger after a Spring Festival lunch in 2013. The family sleeps on the kang, heads facing in, away from the window or outer wall. On winter nights, outside temperatures can drop to -40C. Bedding consists of a narrow pad, a quilt or two, and a hard buckwheat pillow. The warmest spot on the kang is next to the stove. This kang, like most in Niujiatan, sleeps four across. To do this work, I needed the whole village. I was the first Westerner to cross their threshold, and by proposing this project, I was asking the farmers to stretch their minds beyond their experience or vision. The gulf was huge - from insular village mindset to global perspective, from pre-modern subsistence farming to conceptual visual art. Acceptance and support grew in ever-widening circles. Starting with the younger families, endorsement of the project spread to nearby neighbors, outward to more distant neighbors, and lastly into the homes of village elders. The key was finding connection with their lives and the language to describe these strange ideas. By defining the hands, not as art, but as artifacts that exist into eternity, and by naming the project their history, the farmers of Niujiatan grew proud of our work and claimed it as their own. We work together. Every step - from collecting the soil to storing the finished hands - is a joint effort. Early supporters of the project, Qiao Hua (in pink), Niu Jinlin and Deng Lin look through the photos I used to introduce the idea. Niu Jinlin (center, flanked by his son Niu Rui and wife Deng Lin), is a skilled carpenter and handyman. 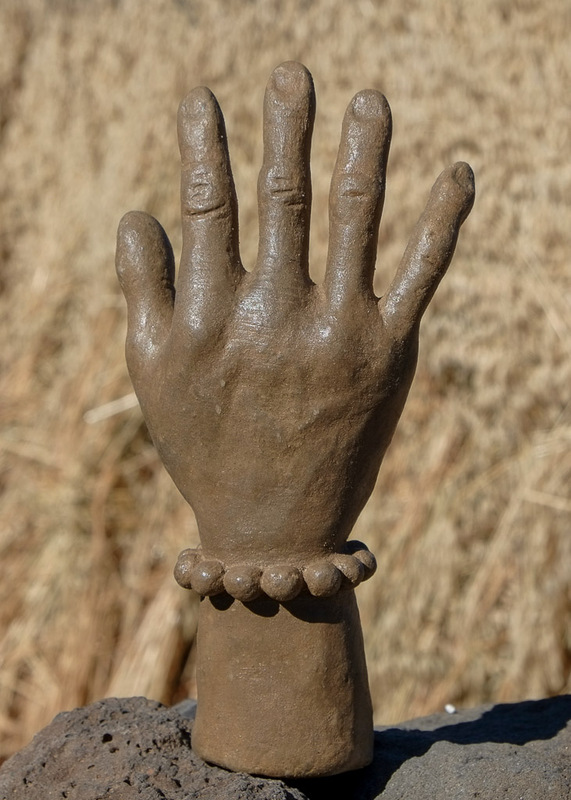 He suggested the yellow loam as material for the hands. In summer 2007 we collected soil from the village pit to begin initial experiments. The first step is to screen out organic material and pebbles from the loam. This all-purpose sieve is ordinarily used to filter flax seeds. 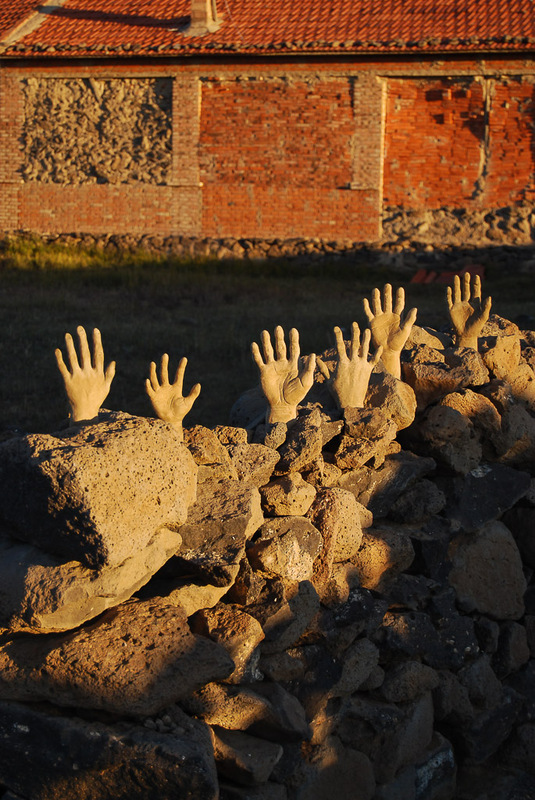 As we talked about hands, the villagers began to look more closely at their own. 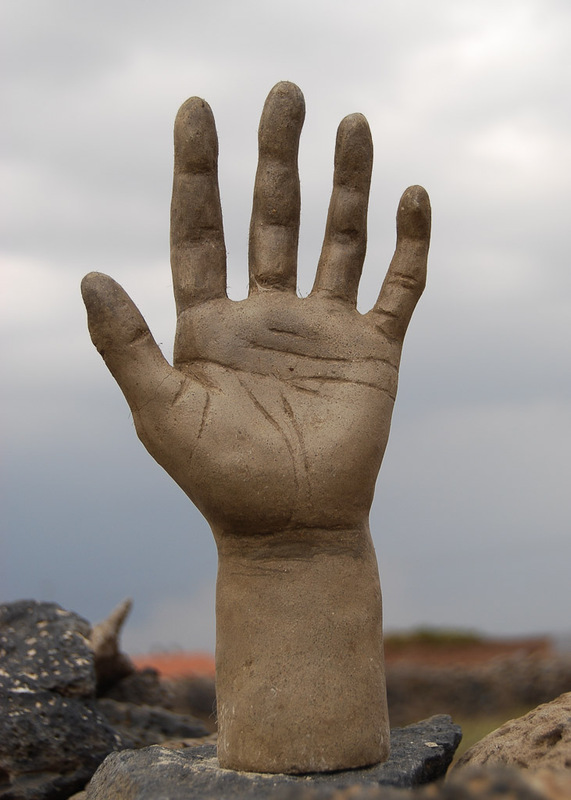 Every woman, regardless of age, insists that her hand is not beautiful enough to be sculpted. And everyone in the village, without exception, expresses appreciation when I add the palm lines, as that unique imprint is recognized by all as the mark of the individual. Niu Rong presses his left (dominant) hand into a clay slab to form the template. I sculpt the dominant hand, which is the primary working hand. 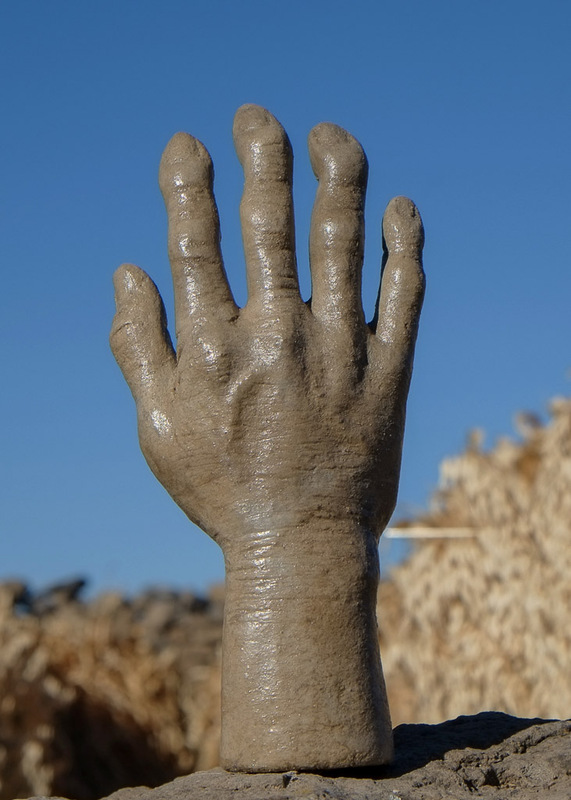 To form a clear outline on the template, I press the clay between the fingers and around the edge of the palm and wrist. Shi Yumei, at 78, was one of the oldest residents of Niujiatan before she and her son moved away in 2013. With her two bad knees, it was hard to get out and socialize. Hand-making in her home brought a steady stream of visitors and welcome diversion. When I finished her right hand, she asked if I would make her left hand and her feet. After a template is created, I mix the soil with cement, water, and cow hair to form a composite which can be molded into the rough shape of a hand. While the hand is still wet, metal pins are inserted as armature to further reinforce cohesiveness and structure. Here they are laid on top to gauge the right length. Behind the hand is a wad of reddish cow hair. Before lifting the hand from its support, I shape and carve the top of the hand to a relative likeness. In November 2008 Qiao Zhi sat beside me on the kang while I sculpted her hand. I make the hands in each family's home. As I am mixing soil, the women are kneading dough, preparing our meal. 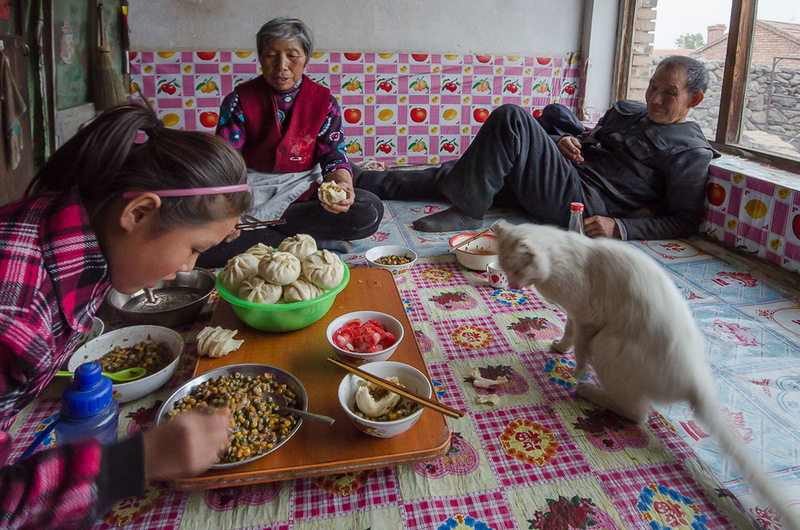 In July 2011, while a rough draft of her hand dried on the kang, Zhang Shuzhi (right) and a visiting neighbor rolled out dough for steamed pork dumplings. A few villagers took special interest in the process of hand-making. A couple studied me carefully as I worked and asked questions. Niu Pingshan picked up a carving tool and made some adjustments. Hand-making gathers a crowd. Neighbors drop in to watch, comment on my work, and chat with each other. In 2008, during a particularly busy season, we had many gatherings such as this one. In this portrait of completed hands, the B&W photos indicate hands yet to be made. Click on a photo to bring up the light box.